Have you applied to a job, walked out thinking you did great and instead got a fat no as the outcome? I went through it several times and I couldn’t understand what went wrong or what I could have done differently. I felt as if I was pushing against a wall of concrete and before a new interview I would lay awake, my neck knotted and tense. Until one day, the hiring manager told me that I was “too nice”. That was a concern she had regarding my promotion to a supervisory role. Too nice? What’s too nice? She didn’t know me, how could she say that? I fell into a hole of outrage and victimisation, blaming the interviewer for not understanding me! It was all about me, me, me! IT WAS NOT AT ALL ABOUT ME! I had to learn a very important lesson: feedback is not personal, it’s an insight into the opinion of another person. Interviewing is like dating. You need to go out on a few dates ( or a lot!) to find the right person and the more you go out, the better you become at dating! You will spot immediately the weirdo to stay away from and the one who is only a friend-zone candidate! Is your opinion a reflection of their qualities and personality traits? Nope, and if you thought so, think again! It’s *your* opinion so it’s a reflection of your own view, preferences and priorities. It’s the same for interviews! That “no”, that feedback at times a bit bitter to swallow, are not a reflection of you as a person but of the opinion of the interviewer. I’m not too nice (is there such a thing?) but that specific hiring manager saw my pleasant and friendly attitude as a sign that I couldn’t handle tough conversations. I applied again, adapted my examples to showcase the qualities that she was looking for. The role was the same, the skillset the same but I prepared considering what she wanted. Did I change personality? Of course not. Did I change my reaction to feedback? Hell, yes! Appreciate it, ask for it, chase it! If you want insight into what your interviewer, boss, employees, clients are thinking, you need to ask for their feedback. And use it! 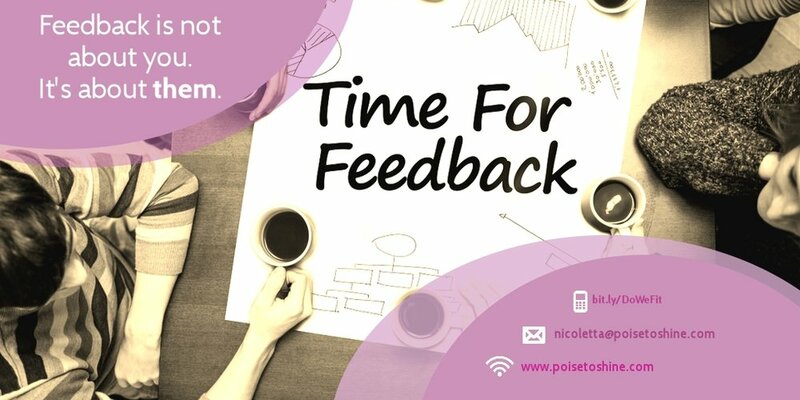 Would you like to develop the confidence to hear any type of feedback and not only to hear it but to use it to leverage your success? Book a call today! We’ll plan the best way to build unshakeable confidence to advance your career!